Zen and the Art of Motorcycle Maintenance has been one of my favorite books since I first read it. It’s a favorite for a number of reasons, but one is that its subject matter is directly applicable to the guitar and being a musician. The above passage particularly struck me when I first read it because it really gets to the essence of the mindset that a person should have while practicing the guitar. Effective guitar practice is tricky. There are a lot of things that can get in the way of making the most of the limited time available for practice, most of which are related to the mental state of the person practicing. Allowing negative emotions to take hold or being stuck in certain mindsets can sap the productivity right out of a practice session. First and foremost, it is important to enjoy practicing. I’ve heard some students make statements that lead me to believe they see practice as a chore, as something that isn’t the least bit enjoyable but will pay off sometime in the future when they are able to play better. This mindset is fundamentally wrong. The guitarists out there who play well got that way because they love everything about the guitar–even practicing. A guitarist with the right mindset will enjoy the process of practicing. They will see how great it is to lose oneself in trying to tackle the problems that arise when learning a new piece or improving a certain skill. They will be excited by the possibilities that lie in improving a certain aspect of their playing ability. They will find fulfillment from seeing the gradual improvement in their playing that comes from effective practice. Mindlessness and distraction are the primary enemies of good guitar practice. It’s important to be completely in the present moment when practicing. The mind should be clear of past frustrations and failures, and also free of expectations or anxiety of what will happen in the future. This applies as equally to areas of life unrelated to the guitar as it does to past experiences or future hopes that pertain to music. Your mind should be focused completely on the task at hand. Worrying about the workday tomorrow, an upcoming gig, the difficulty you’ve had learning a certain song, or your recent breakup with your significant other has no place in the practice room. If you can achieve this presence of mind, it can actually be therapeutic and help with going through difficult times. You also have to be mindful of what’s happening when you practice. Being aware of where you stand in the process of learning what you’re working on, where exactly the problems are and their causes, and how you might go about fixing them is crucial. The way you go about practicing should be based on these factors, so taking some time to assess these things and keeping track of how they change as you go about practicing is hugely important. More often than not, I find that students aren’t thinking about these things when they practice. Instead, they quickly run though the material at hand. They ignore the ‘problem spots’ in the songs they are working on and spend more time than needed on parts they can play more easily. They get frustrated by mistakes or, just as bad, simply accept that these mistakes or breakdowns in the flow of the song are inevitable. Frustration is the main emotion that should be avoided. When things don’t work the way they should and when mistakes keep happening, rather than letting frustration boil over you should stop, take a step back and examine the situation. Remember that there is a root cause for every mistake. Think rationally about what the mistake is and where it is happening. Keep emotions out of it and instead become a ‘practice scientist’ who experiments and observes. Figuring out these problems and working through them is where the practicing really takes place. 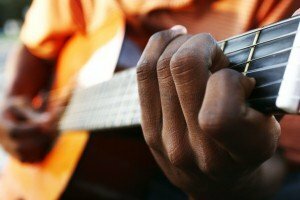 Granted, there is a lot more to making the most out of guitar practice, and these bits of advice might seem basic. However, maintaining a peaceful mindset is so fundamentally important that it’s good to be reminded of it every once in a while. Any other advice on good practice habits will depend on the advice given here. If you find yourself not enjoying the journey of learning the guitar or if your playing is stagnant, its worthwhile to ask yourself if you are really cultivating the kind of mindset that is needed to both enjoy and improve on the guitar. Posted in Practice and tagged Beginners, Intermediate, Mindfulness, Practice.